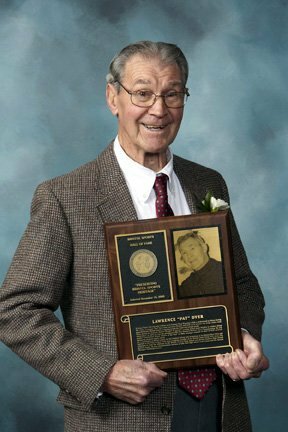 A former boxer who was once written up in boxing’s Ring Magazine while a professional in Maine during the 1940s, Lawrence “Pat” Dyer later moved to Bristol and went on to become one of the state’s most successful Senior Olympic athletes, competing in both the winter and summer games. Twice during the Summer Senior Olympics he gained a number of first place finishes in outdoor skiing competition. In 1975, he won the prestigious 20K New England Masters Open Championship. He was named “Connecticut Senior Athlete of the Year” in 2004, among a number of other awards received during his amateur sports career. As a contributor to Bristol sports, he has coached boxing and swimming at the Bristol Boys Club and baseball in the Pony League while also a longtime member of the Bristol Chain Gang crew, those who volunteer to work the sidelines at the Bristol Central High School and Bristol Eastern High School football games. He has volunteered his services at both local high school track events and the Special Olympics Challenger Series.